Sea hooks come in a bewildering variety of styles and sizes, but each type has a distinct function: the thoughtful sea angler rrakes the right choices and keeps them sharp. No item of the sea angler’s equipment is more important than the hook which, after all, is in direct contact with the fish and so has to withstand all kinds of strain. Despite this, hooks often receive scant attention. Many anglers will cheerfully part with £100 for a rod, reel and line, and then go out of their way to buy cheap hooks, which are brittle, poorly finished and often quite unsuited to the job they are expected to do. Others purchase good hooks, but then allow them to become rusty and blunt, with points that will hardly penetrate the softest mouth. Before we look at the most popular hooks for sea fishing, it is well to examine the method of manufacture that produces a good hook. Most are made from high-carbon steel wire. One machine straightens the wire from a large coil and a second cuts it to the appropriate length. The ‘needles’ obtained from this operation are then ground to a rough point, and another grinding imparts a fine hollow-ground point. The blunt-end of the shank may now be ‘pennelled’ or tapered by grinding, which allows the eye to be closed up smaller and neater. A steel chisel cuts a barb in the needles as they move round a rotating drum, the angle and the depth of the incision being determined by the setting of the chisel. The next step is bending, which is carried out round a mandrel or cylinder. Variations on the angle of the bend are numerous, and each style of hook and size has its own. The eye is now formed. It is either left straight or can be set towards or away from the point. Some hooks, for example, those used in mackerel fishing, are flattened in the shank, while others have grooves for whipping on flies or feathers. For extra strength, large hooks can be brazed, as are the Mustad Seamaster range, which are used for shark and game fishing throughout the world. This kind of hook is also subjected to anti-corrosion tests in a salt spray chamber in accordance with internationally agreed standards. To minimize corrosion, hooks are plated with either bronze, tin, nickel or even, as has been known, gold. Treble hooks, which are now widely used for pirk fishing over deep-water wrecks, are also brazed. As much of the work is done by hand, the cost can be considerable. Hardening and tempering by heating, and then cooling with oil, give maximum strength and resilience. Finally the hooks are scoured in revolving drums filled with an abrasive, and then polished in a similar way with a mixture of sawdust and oil. A fair proportion of anglers are confused by the multiplicity of hook sizes, which largely stems from the traditional use of private scales. The world’s fish hook manufacturers now use only the internationally-accepted British (Redditch) scale. So much for hook manufacture and sizes. This still leaves the bewildering array of styles of hook. For sea fishing this can be reduced conveniently to around half a dozen kinds. Among the most popular is the razor sharp, straight eyed Aberdeen hook which has a long shank made from light wire. Perfect temper prevents any straightening despite the extra leverage from the shank. 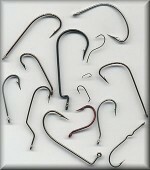 This hook is used extensively for estuary fishing, particularly for bass, plaice and flounders. As it is so fine in the shank of wire the Aberdeen hook is most suitable for baiting live sandeel and prawn. Shore anglers who fish from the precipitous rock ledges of the north Cornwall coast also swear by them for spinning with deadbaits for fast-moving mackerel, garfish, pollack and bass. Some will argue that it is the only hook for saltwater fishing. That is a bit sweeping, but every self-respecting sea fisherman should be equipped with a range of Aber-deens between the sizes No 1 and 4/0, with the emphasis on No 3/0. For general bottom fishing three kinds stand out – Limerick, Kirby and O’Shaughnessy. The Limerick is well suited to use with a paternoster for bream, whiting, pouting, cod and ling, its pull being direct and its penetration excellent. For ledgering there is little to choose between the other varieties, which have a wide gape between the point and the shank, but the O’Shaughnessy is the strongest and particularly suitable for holding such heavy fish as the conger eel. The conger is a fish that demands and receives respect from beginner and expert alike. In the past decade wreck fishing has produced some enormous congers, some over 100 lb in weight. To cope with the strength and sawing motion of the conger’s jaws and to withstand prolonged battles, a hook must be durable, and this is where the forged eye hook comes into its own. Eels over 50 lb have a large appetite, and the experts think little of offering a whole bream weighing as much as 3 lb. Such a bait, intended to attract huge fish, requires a forged hook of either No 10/0 or 12/0 attached to a couple of feet of cable-laid wire. No matter how much pressure this kind of hook receives, it will not straighten out. No article on hooks would be complete without reference to the care of them. While most are sharp when they leave the factory, handling can easily dull them, and so it is essential to examine each one before it is used, and from time to time while fishing. Any with a slightly turned point and those lacking needle sharpness should be gently honed with a good stone. Soft Arkansas whetstone, used with a light oil, is perfect for the job. Hooks that show signs of irreparable wear must be discarded after each trip. Failure to observe this simple rule could mean, in some circumstances, the loss of the fish of a lifetime. Should you use fixed spool reels for sea fishing?